Call options give the buyer the right, but not the obligation, to purchase an underlying asset. They are available in various strike prices depending on the current market price of the underlying instrument. Expiration dates can vary from one month out to more than a year (leaps options). Depending on the mood of the market, you may choose to buy (go long) or sell (go short) a call option. If you choose to buy or go long call options, you are purchasing the right to buy the underlying instruments at whatever strike prices you choose until the expiration date. The premium of a long call option shows up as a debit in your trading account. The premium amount represents the maximum risk a long call strategy can incur. Profit is made on long calls when the prices of the underlying assets rise above the strike prices of the calls. You can then either exercise the calls or offset them by selling calls with the same strike prices and expiration date. By exercising long calls, you end up with 100 shares per option of the underlying stocks at the call strike prices. You can then turn around and sell the underlying assets at the current (higher) prices to garner a profit on the difference between two (current prices – strike prices = profit). 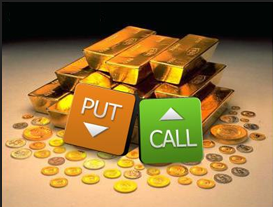 If you choose to offset the call options, the maximum profit is unlimited. The call’s premium will increase in value depending on how high the underlying instrument rises in price beyond the strike prices of the call. As the price of the underlying asset rises, the long calls become more valuable because they give you (or the person you sell them to) the right to buy the underlying stocks at the lower strike prices of the calls. That’s why you want to go long call options in a rising or bull market. If you choose to sell or go short call options, you are selling the right to buy the underlying instruments at particular strike prices to an option holder. Selling call options prompts the deposit of a credit in your trading account in the amount of the call’s premium-a limited profit. You get to keep this credit if the option expires worthless. Thus, to make money on short calls, the price of the underlying assets must stay below the calls’ strike prices. If the prices of the underlying assets rise above the short call strike prices, they will be assigned to an option holder who may choose to exercise it. This gives the option holder the right to buy 100 shares (per option) of the underlying stock from the assigned option buyer at the strike price of the short call. This means that the option seller must buy the underlying assets at the current prices and sell them at the calls’ lower strike prices to the assigned option holder, thereby incurring a loss on the trade (current prices – strike prices = loss). The maximum loss is therefore unlimited to the upside, which is why selling “naked” or unprotected call options comes with such a high risk. However, experienced traders who do choose to short call options would be wise to do so in a stable or bear market. Call options give you the right to buy something at a specific price for a specific time period. However, if the current market prices are more than the strike prices, the call options are in-the-money (itm). If the current market prices are less than the strike prices, the call options are out-of-the-money (otm). If the current market prices are the same as (or close to) the strike prices, the call options are at-the-money (atm). Example: A local newspaper advertises a sale on VCRs for only $129.95. The next day Jane goes down to the electronics store intending to purchase a vcr at the advertised price. Unfortunately, by the time she arrives, the vcr is already out of stock. The manager apologizes and gives her a rain check entitling Jane to buy the same vcr for the advertised price of $129.95 anytime within the next two months. Jane has just received a long call option which gives her the right, but not the obligation, to purchase the vcr at the guaranteed strike price of $129.95 until the expiration date two months away. Scenario 1: A few weeks later, Jane return’s to the store to exercise her rain check. The same vcr is now in stock, priced at $179.95. Jane approaches the store manager who agrees to honor the rain-check and sell her a vcr for the advertised price of $129.95. Jane has just saved $50. Her long call option was in-the-money. Scenario 2: A few weeks later, Jane returns to the store and finds the vcr on sale for $119.95? Her rain check is now worthless because she can simply purchase the vcr at the reduced price. In this case, Jane’s call option expired worthless because it was out-of-the-money. Just because you own a long call option doesn’t mean you are under any obligation to use it. Scenario 3: Jane’s friend Jeff phones and mentions that his vcr has just broken. She tells him about her rain-check and agrees to sell it to Jeff for $5 (the option premium). The strike price is still $129.95 and the expiration date is 2 months out. However, Jeff is taking a risk. The vcr might be priced lower than the $129.95 strike price in which case the rain-check is worthless and Jeff loses $5. 1. Call options give traders the right to buy the underlying stock at the strike price until market close on the 3rd Friday of the expiration month. A call option is in-the-money (itm) if its strike price is below the current price of the underlying stock. A call option is out-of-the-money (otm) if its strike price is above the current price of the underlying stock. A call option is at-the-money (atm) if its strike price is the same as (or close to) the current price of the underlying stock. 2. Buying Calls – If bullish – believe the market will rise – buy (go long) calls. Buyers have rights. A call buyer has the right, but not the obligation, to buy the underlying stock at the strike price until the expiration date. If you buy a call option, your maximum risk is the money paid for the option, the debit. The maximum profit is unlimited depending on the rise in the price of the underlying asset. To offset a long call, you have to sell a call with the same strike price to close out the position. By exercising a long call, you are choosing to purchase 100 shares of the underlying stock at the strike price of the call option. 3. Selling Calls – If bearish – believe the market will fall – sell (go short) calls. Sellers have obligations. A call seller has the obligation to sell 100 shares of the underlying stock at the strike price to the person to whom the option was sold, if that person chooses to exercise the call option. Sellers have obligations. If you sell a call option, your risk is unlimited to the upside. The profit is limited to the credit received from the sale of the call. When selling calls, make sure to choose options with little time left until expiration. Call sellers want the call to expire worthless so that they can keep the whole premium. To offset a short call, you have to buy a call with the same strike price to close out the position.